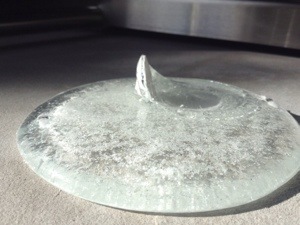 Here is a recent studio experiment with a sand dollar and glass. 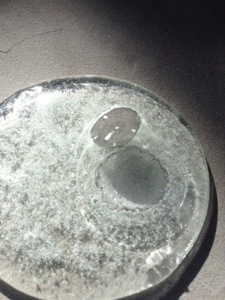 A sand dollar laid between 2 pieces of glass (see the top photo). A 24 hour fuse up to about 1500 degrees F created the bottom pics. I’m not sure what created the air bubble, but it looks like some air that was trapped between the glass created the thin bubble and pushed the sand dollar up. That combined with the organic materials of the sand dollar and also the space between the glass. I’ll post the pine cone, pine needs and other ones soon. They all turned out to be cool and different.